Whānau Bake Off: Episode 14, Delaney Mes - My Food Story. Regan and Maria are used to being on stage but they’re not as confident about their performance on a baking show. Master chef Cameron Petley determines who wins bragging rights. Entertaining and competitive sisters Lanita and Kihi aka “The Native Diva” and “The Creative Native” go head to head to win bragging rights and prizes. Judging today is Executive Chef Nancye Pirini. Wiki and Ngawai are cousins who bake seriously delicious kai – Rewena with Creamed Paua, chocolate coated shortbread and the perfect sponge cake. Tumanako Tinirau gets to taste but somehow must choose a winner. 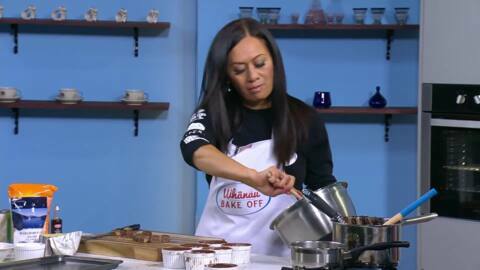 Whānau Bake Off: Episode 15, Tumanako Tinirau - What Makes a Good Baker. Whānau Bake Off: Episode 15, Tumanako Tinirau with Wiki and Ngawai. Kahurangi Maxwell hosts the battle of the sweet treats. Sisters Jo and Jax bake incredible chocolate cakes for whānau bragging rights while guest judge, foodwriter and blogger Delaney Mes shares an incredible brownie recipe. Whānau Bake Off: Episode 14, Delaney Mes with Jo and Jax. 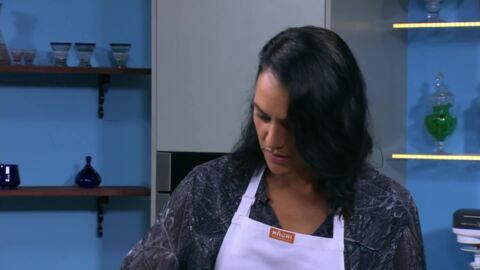 MKR finalists Aaron and Heather compete in a pineapple pie showdown, hosted by Kahurangi Maxwell. Whose ka pai pineapple pie can catch the judge’s eye? That’s up to Dunedin’s king of baking, Kevin Gilbert.